Being active has become the numero uno priority for most of us as our food and lifestyle has changed a number of things in our life and they aren’t positive. We’ve replaced arduous and laborious work with white collar jobs within cabins and kids these days have opted the playstation controller over cricket bats and football. They end up playing World Cup or Fifa 16 in that playstation which is the biggest irony. 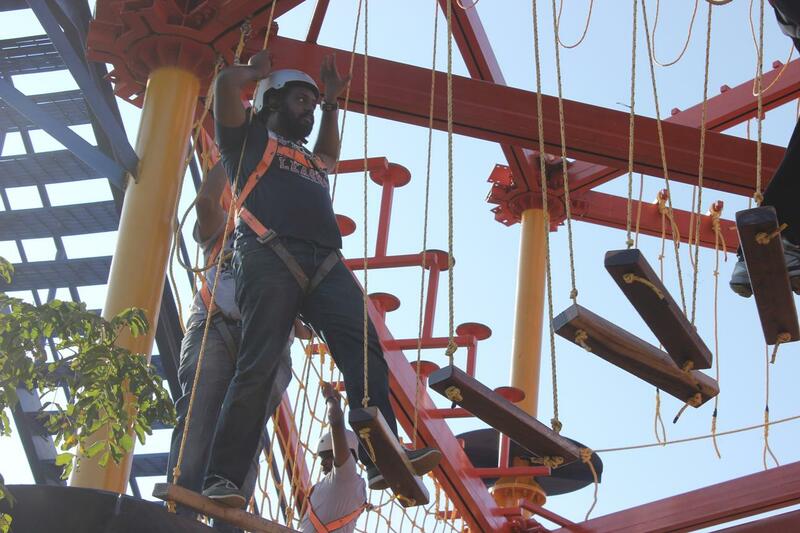 Adventure parks are a craze all around the globe, especially in USA and the UK. During my tenure in the UK , I was lucky enough to try Go Ape, which was a wonderful experience. It got me in touch with my inner Tarzan (Trust me, everyone has one). 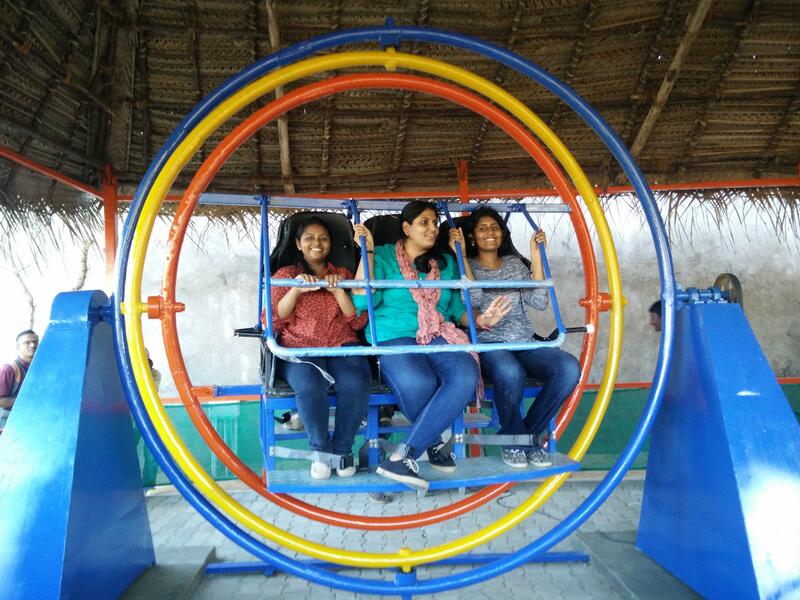 Adventure parks have taken it’s sweet time to reach the shores of Chennai and I’m glad it finally did. 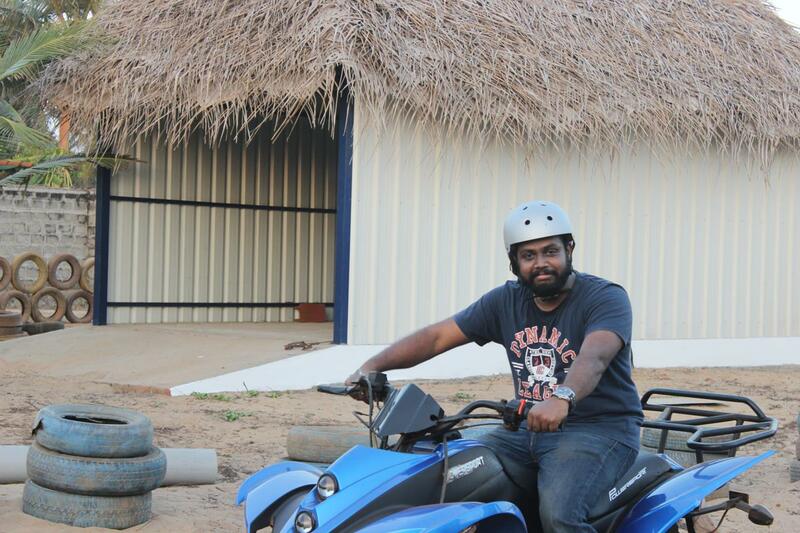 I was pleasantly surprised when I got to know about Wild Tribe Ranch and thanks to an invite from Chennai Bloggers Club, I was one among those few lucky patrons who got to enjoy the facilities at Wild Tribe Ranch. 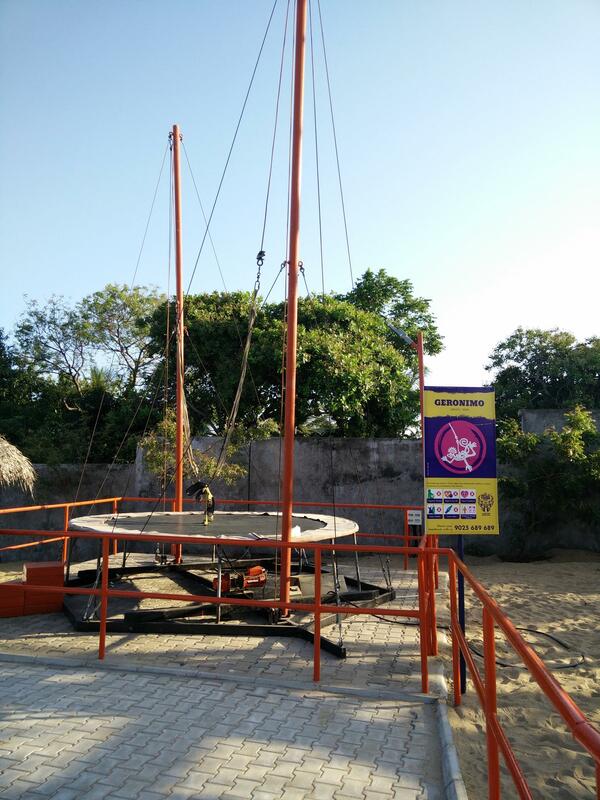 Wild Tribe Ranch is touted to be Chennai’s first and only adventure sports and outboard training arena. 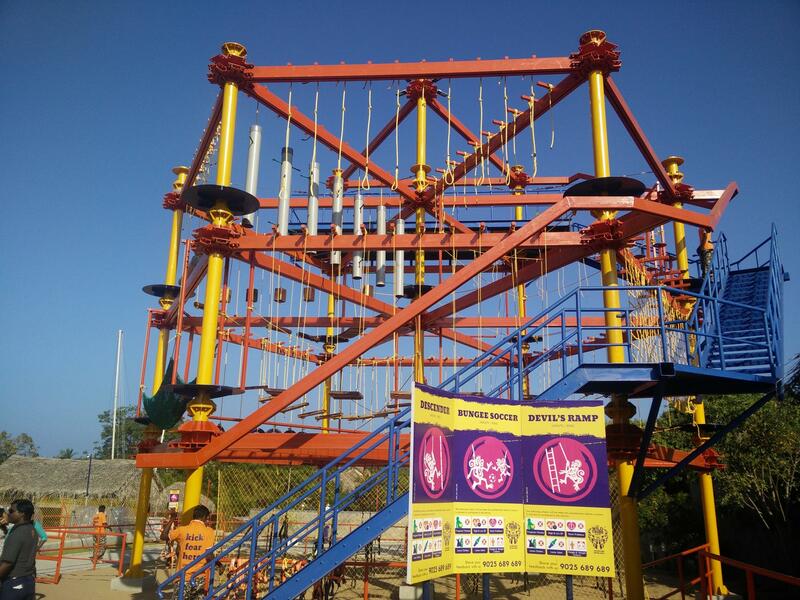 They aim to provide world class adventure activities backed by best in class safety standards. There are a number of activities that range in difficulty, making it perfect for all age groups. 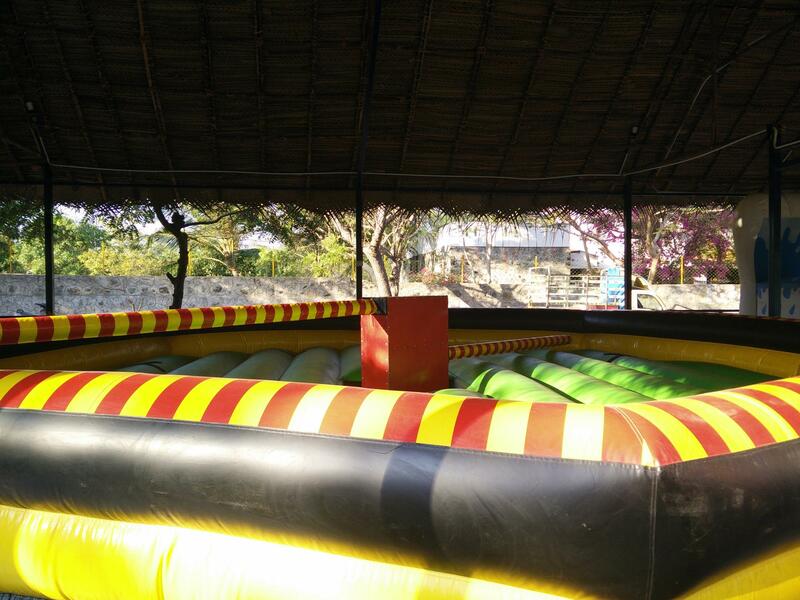 Be it a day with friends or a corporate outing with colleagues, the activities here are designed to entertain all along with building some quality features such as camaraderie and team work. Safety is the biggest concern at such places and they’ve taken commendable measures to prevent mishaps and in case something does happen, they have well trained staffs to handle situations. Micmac (‘My friend’ in Native American language) the monkey is their mascot and in my opinion, they couldn’t have come up with something better than this. Wild Tribe Ranch is located in one of the most arterial roads of our city, the East Coast Road. It’s just a stone’s throw away from The Crocodile Park and is also near the recently incepted Intercontinental Resorts. Our national flag, fluttering blissfully and the large orange boards that spell out Wild Tribe Ranch are some of the features that are hard to miss. There is abundant four wheeler parking space which is of prime importance considering the majority of the crowd would be using their own transport. That said, local buses run frequently from city centre through this place. A point worth knowing is that Wild Tribe Ranch used to be in Ponneri and their relocation to this other end is a brilliant move. With more families choosing ECR to cruise and the IT hub OMR nearby, Wild Tribe Ranch is definitely going to be busy. Huge is an understatement when one tries to explain how big this place is. The rides are placed with a good distance between them and there is a good amount of greenery in this area. 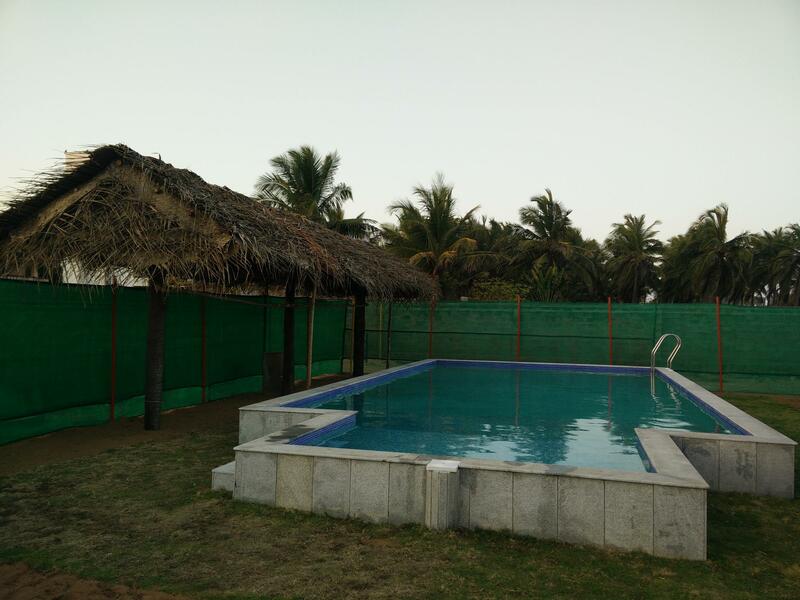 Apart from the activities they also have other features such as swimming pool and lodging facilities. More on that below. 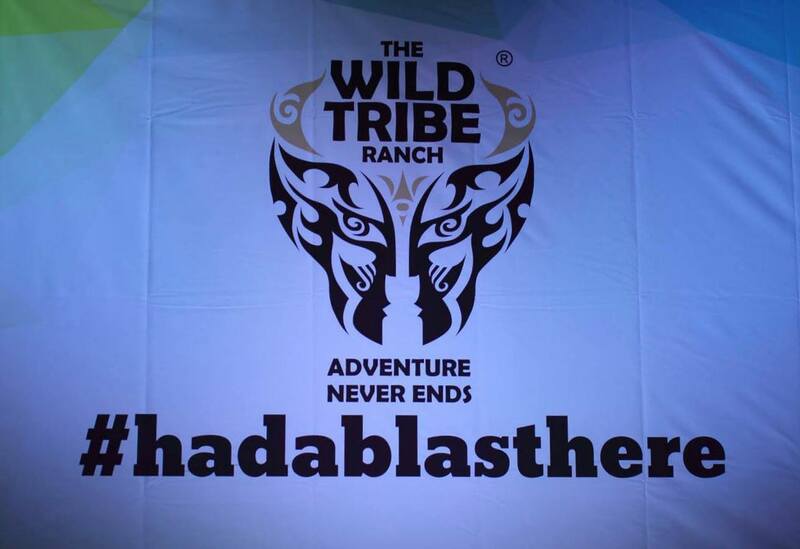 After listening to a quick talk from one of the managing partners regarding the features of Wild Tribe Ranch, we were guided to our rides. Staff members who are referred to as Guides, directed us to the rides and also explained how it works. Given below are the list of rides we tried. 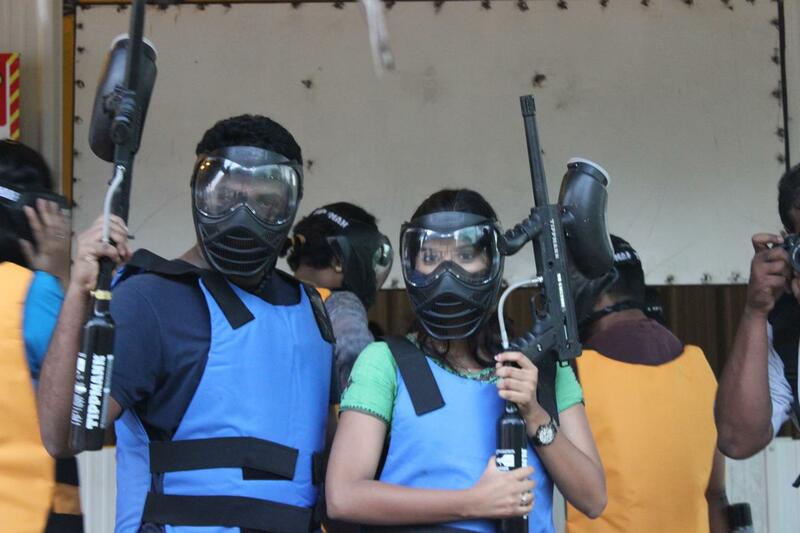 Their first activity is undoubtedly their best and the most daunting one too. 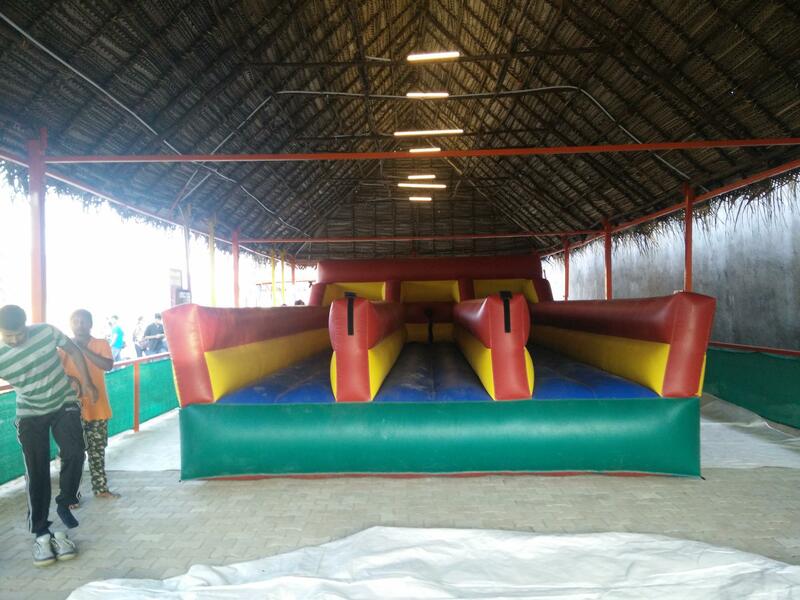 The Devil’s ramp is two decks of various obstacle course type activities which can be done in any order. Safety harnesses are provided and they’re brilliantly engineered to follow us without disrupting our moves. At the top deck is the Flying Fox, a zip line that would shoot us to the other end of the ground. Unfortunately, that ride was yet to open when we were there and hence we couldn’t try it. A word used to describe excitement when leaping from a great height as well as the name of a Native American prominent leader who fought for the rights of his people, this aptly named activity is something most of us are familiar with. After getting strapped to two poles on opposite ends, a person has to jump on the trampoline which would catapult him/her towards the sky, only to be pull backed down by the straps. They have two variations for kids and adults. Zorbing is a sport that’s slowly making it’s mark here in India. This mini zorbs are the ones that go till ones hip, thereby messing a bit with one’s balance. Teams are formed and folks are meant to play soccer by ornamenting them with the zorb orbs. Bungee Soccer on the other hand is where the players are strapped to bungee cords and are made to play soccer again. They won’t be able to move freely as the cords keep pulling them back which makes it interesting to watch and funnily frustrating to play. We wanted to give it a shot but we were stuck with other rides which ate through our time. 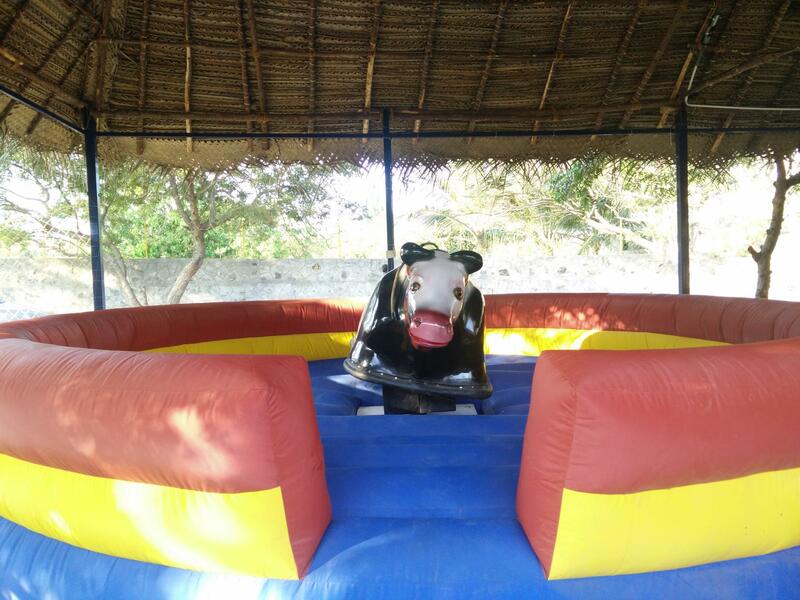 This ride involves getting on top of a bull shaped mechanism that’s controlled to move according to the wish of the controller who tries to bring down the rider. Bullie the bull tests the balancing skills of the participant. 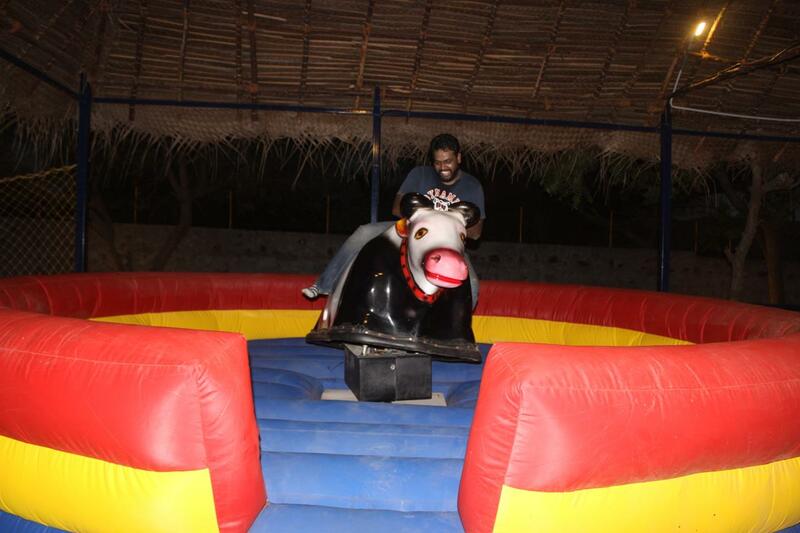 Apart from the fact that it looked more like a calm cow rather than a bullying bull, it was a fun ride. 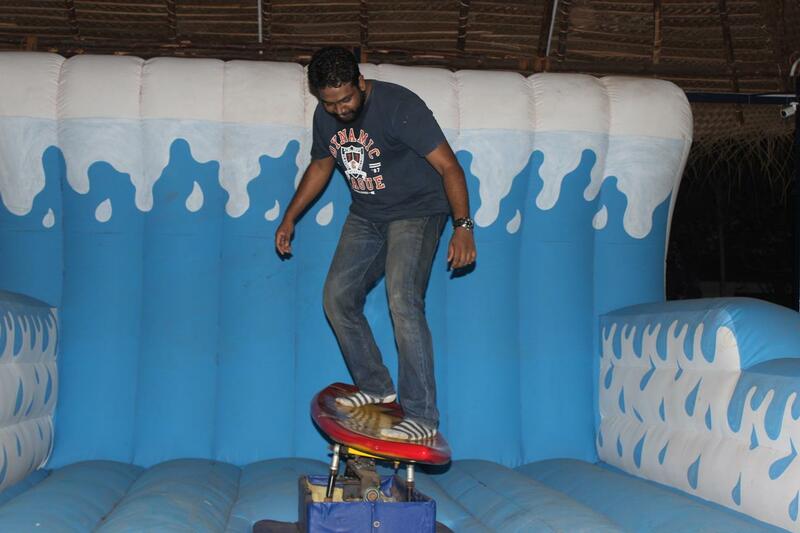 Yet another activity that tests the balancing skills. 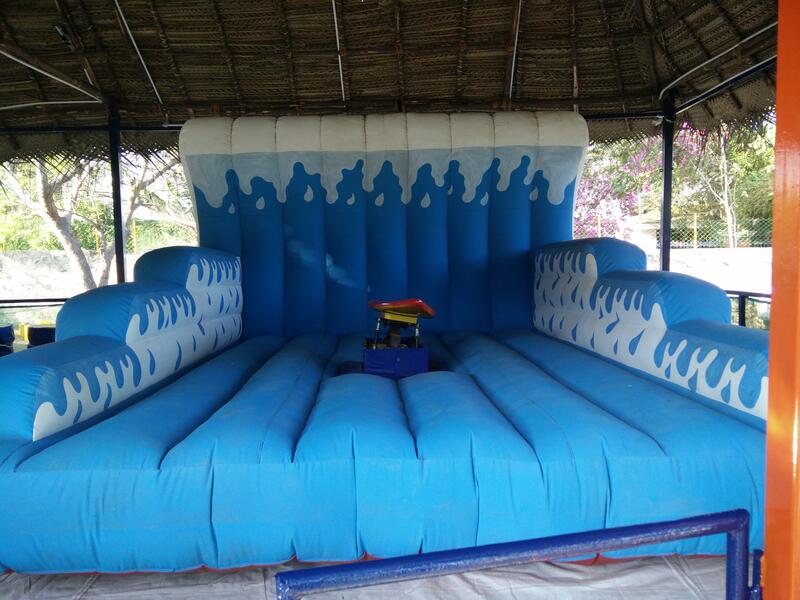 This is also an operated ride where the motive is to stay on the surf board as long as possible as it is made to move vigorously to bring down the participant. Dodge & Jump is a ride that’ll be familiar to those who’ve watched the American game show, Wipeout. Two poles of varying heights go on a circular motion and the idea is to jump the pole that’s at shin level and to dodge the pole that’s at chest level. This ride wasn’t open when we were there so I wasn’t able to try it. This must probably be the only ride that reminds one of amusement parks. Six people, three on each side are strapped onto a platform that rotates and revolves at the same time. Those who tried it, loved it. The names gives away the idea behind this activity. Simple rules such as an over per player and hitting the ball towards the furthermost corner being considered as a boundary is sure to be nostalgic to those who’ve played street cricket with their own rules to determine runs. Though not unique, it was quite fun. Yet another classic amusement park activity is this Bungee Run. Three participants Velcro strap bungee cords around their waist and are given soft cotton packets. Velcro sheet runs as a line down the ridge that separates the three sections. The aim of this activity is for all three participants to start at the same time, try to run as much further as they can as the bungee pulls them back and place those cotton packet as far away as possible. The one who manages to place it at the farthest distance away from where they started wins. This one was really fun. Undoubtedly, the most exciting ride in Wild Tribe Ranch must be the Dune Buggy and Mad Riders. 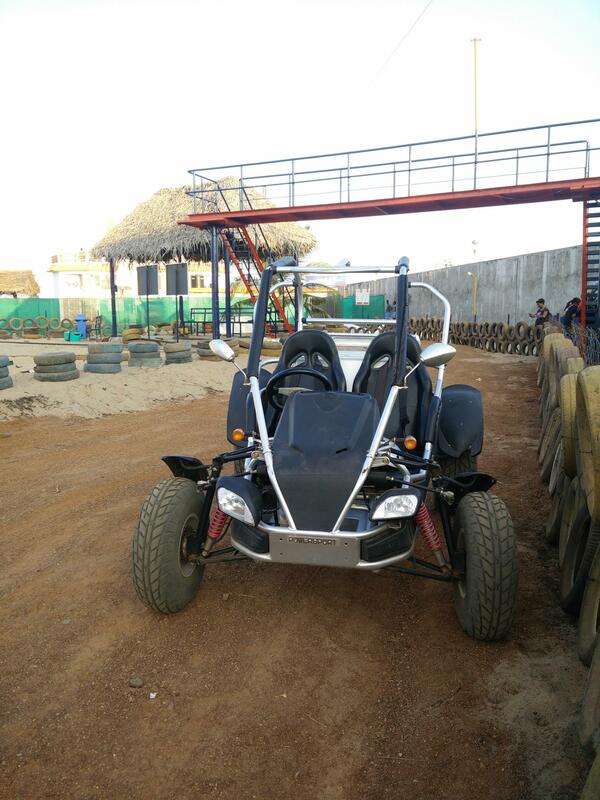 They are ATVs (All Terrain Vehicles) that the riders can take to enjoy a ride in their custom made sand track. We weren’t able to try the Dune Buggy which is a two seater but I was lucky enough to get my hands on the Mad Riders which is a solo seater ATV. Curling the accelerator to hear the powerful engine scream is what a motorhead’s dreams are made of and riding the raw powered machine was indeed exciting. Last but certainly not the least, Paintball (known here as Totem Chroma) is the ultimate activity one can experience as a group, here in Wild Tribe Ranch. Paintball doesn’t need much of an introduction as almost everyone is familiar with the rules and motive of this sport. For those who aren’t aware of it, this is a team sport where two teams of equal numbers are given a post to cover with pressurised marker (gun). Paint pellets are pre-loaded into the marker and one must try to eliminate their opponent by hitting them. 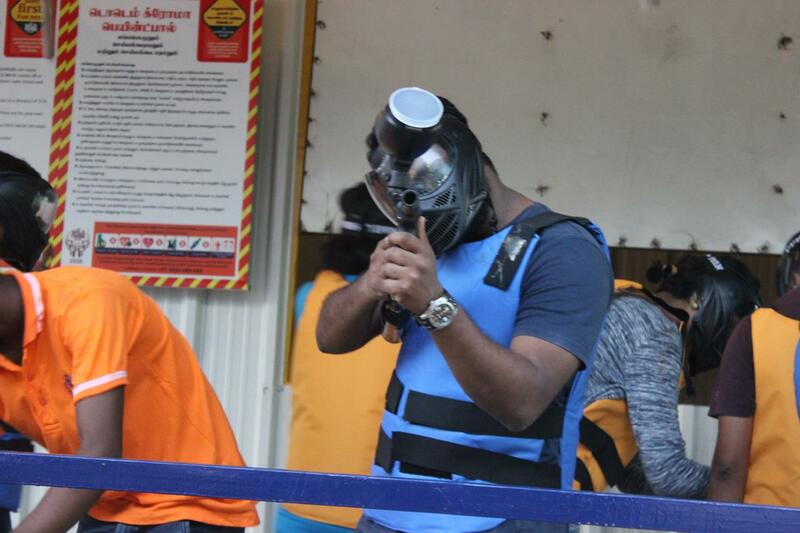 Subhiksha Venkat and I were a part of the team and we were given face masks, helmets and body vests which are different coloured to differentiate teams. I knocked one of my opponents only to be taken down in the next round. But at the end our team won. Overall, this was super fun and something that everyone should give a shot at. 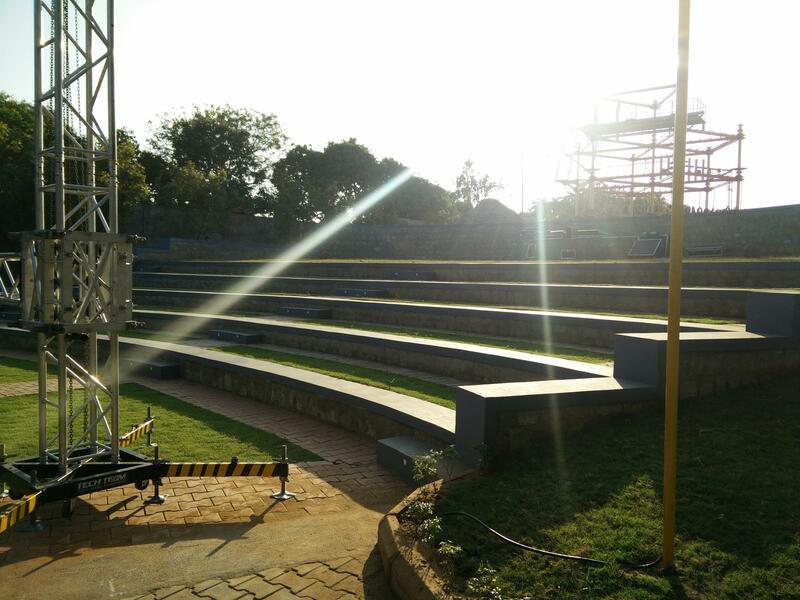 Apart from the above mentioned activities, they also have an outdoor hall which can be used for concerts and other programs. 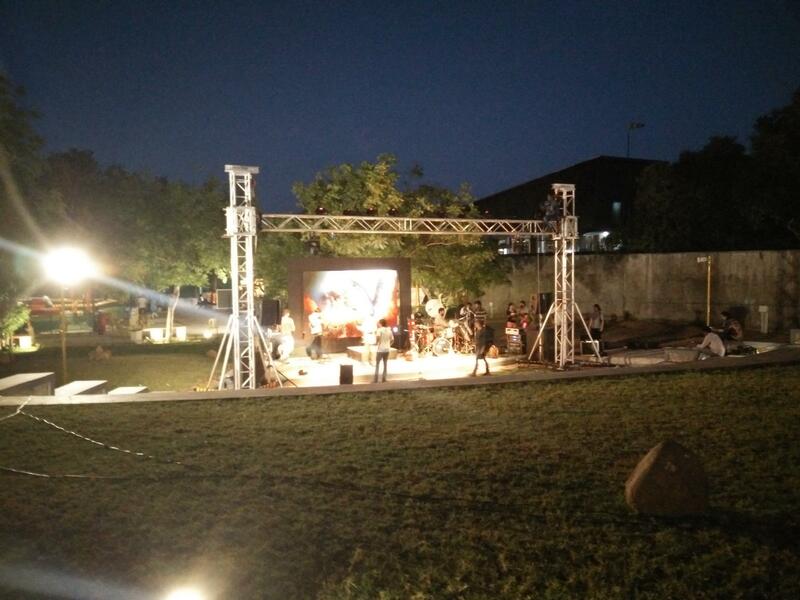 While we were leaving they were preparing for a music show. Light refreshments were also provided and the foodie in me couldn’t control himself to try what they served. 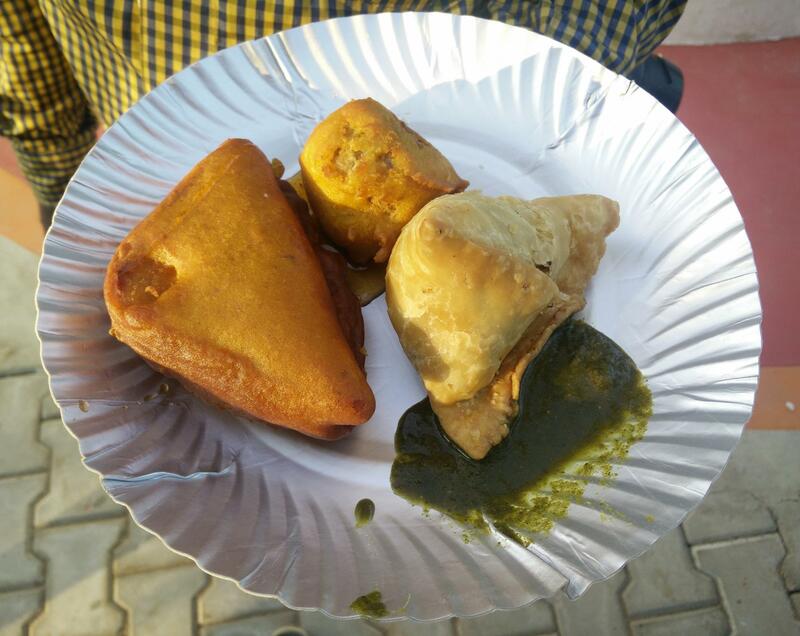 It was a couple of Indian snacks such as bread bajji and samosa with green chutney. They also served hot coffee and tea. The snacks served could definitely be much better and the drinks were too watery. Plus, after running around, what my thirst wished to be quenched with was some cold beverages which weren’t available. But they have mineral water bubble tops all around the park which comes in very handy. 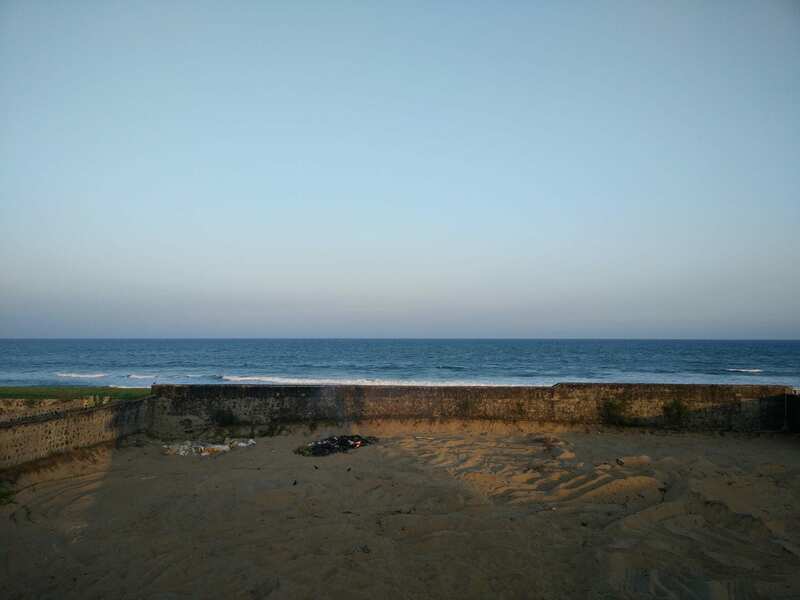 There is also a beach facing property which will be a source of accommodation for the groups that want to spend a night here. 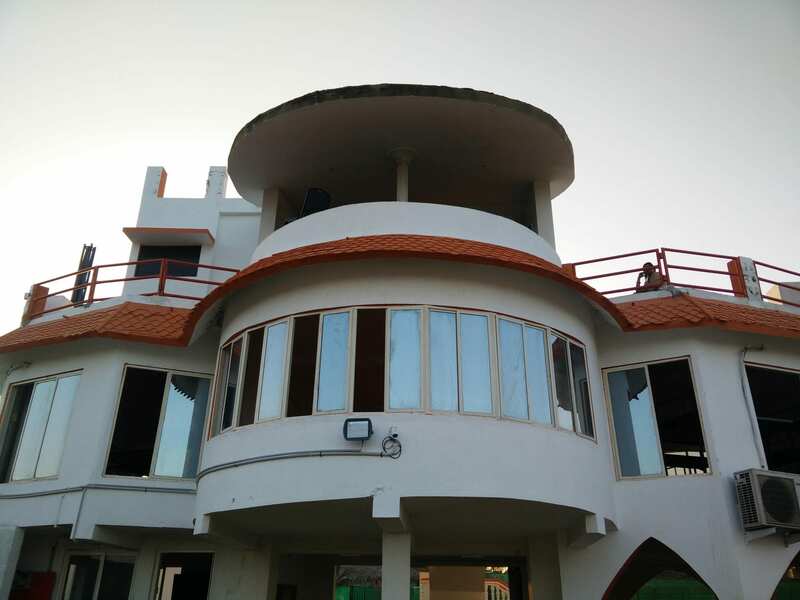 The view from top of the building is scenic and there is also a kids swimming pool for those families with kids to enjoy. Overall, it was a tiring yet fun filed day. We all had a chance to be active and away from our boring desk jobs which involved little to no movement. What amazes me more than the variety of activities here are the safety measures which are strictly followed and the well trained guides who served us with a smile across their face. The evening ended with a customary selfie and I think our exhausted faces are more than enough evidence to show how much we enjoyed. Check out Wild Tribe Ranch’s tariff card and other facilities here. 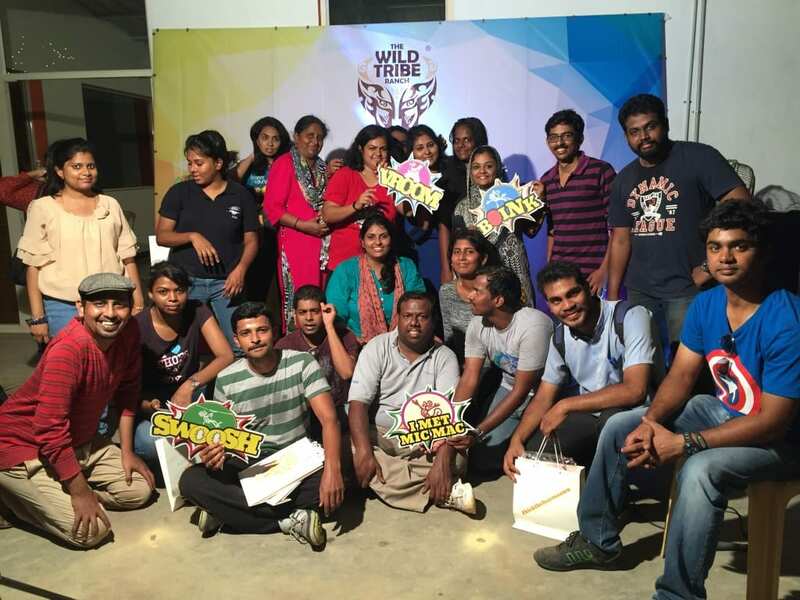 Yet another amazing event from the stables of Chennai Bloggers Club and I can’t wait to be a part of their next one. 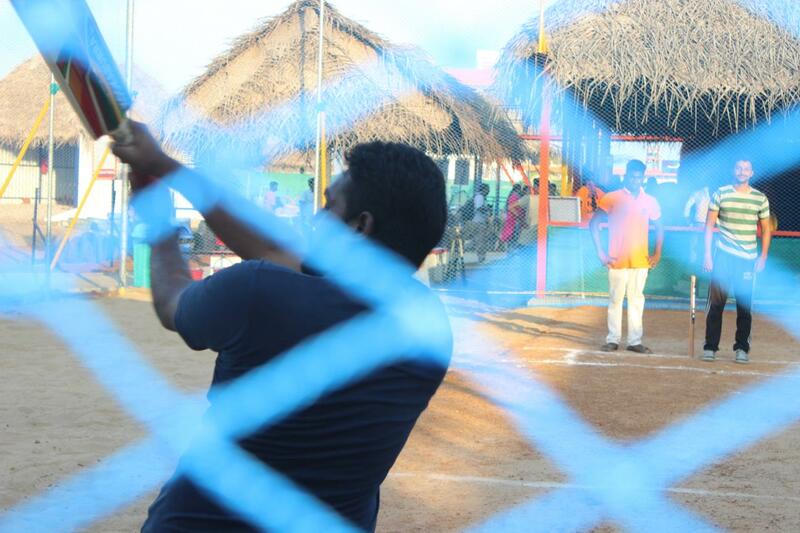 Thanks for the photos Divya Srinivasan and Chennai Bloggers Club.